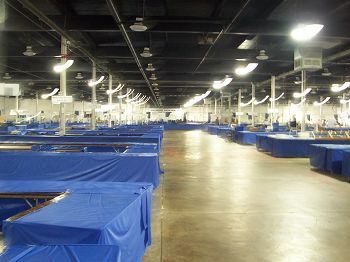 The East Coast show is the third largest show in the United States after Denver and Tucson with over 200 dealers from around the world set up to offer specimens. 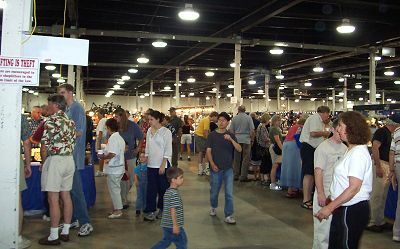 It is all held in the Eastern States Exposition Hall located in West Springfield, Massachusetts which is just north of the Connecticut state line. This report will cover what is new in minerals - at least to me and also offer some pictures of minerals and the people behind them. and wet was the general forecast during the show. I have said it before and will say it again - setting up for shows is A LOT of work! scene out of the movie "Jaws" as Phil unwrapped another specimen and the "sharks"
reached in to grab the new piece of "meat" first. 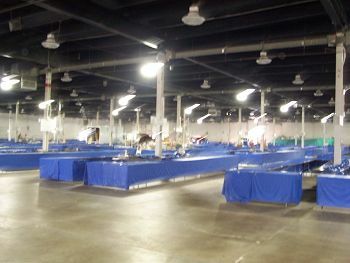 Set up day is also the best day for me to get around and see what people have that is new at the show. I found two dealers who had new material. 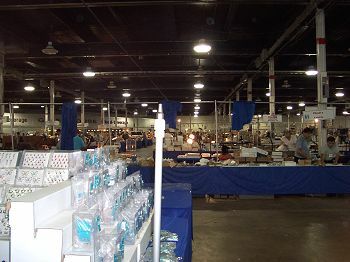 This year there's a fair amount of new things at the show. 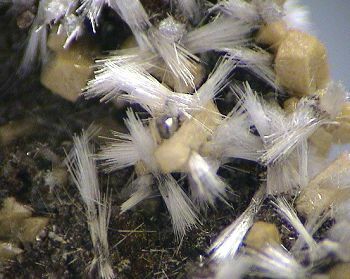 Rocko Rosenblat of Rocko Minerals had a new find of acicular bultfonteinite with poldervaartite from the N'Chwaning mine in South Africa. These were first shown at the Rochester Show in April but this was the first showing at a large show. 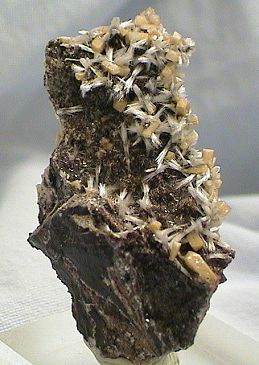 Bultfonteinite was found mostly as mammilary or botryoidal masses of a light beige color frequently found covered with white orlymanite. This was a significant find for the mineral in acicular form. It has been seen before in this habit but nothing in this quality or quantity. of poldervaartite and bow-tie clusters of acicular bultfonteinite. 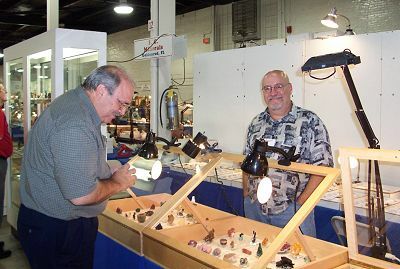 Terry Szenics was set up at the show and had several new items from Chile including a superb find of the rare lead bearing mineral Caracolite from the Challacollo Mine near Oficina Victoria, Chile. 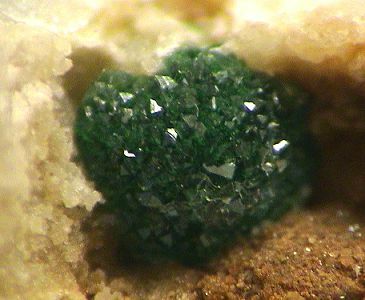 This find is a quantum leap above previously known specimens of this mineral. 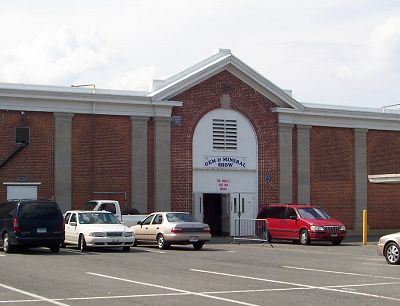 It is comprised of sodium, lead, sulfate and chlorine. 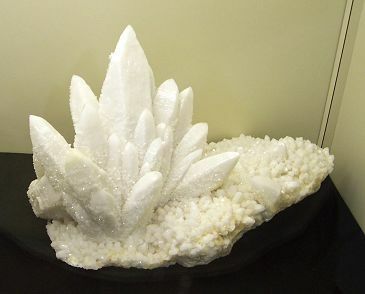 Alfredo Petrov also has specimens of this rare mineral available. 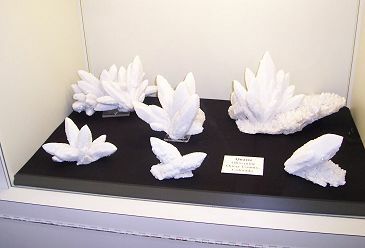 These two pictures are of one of the specimens of caracolite that Terry Szenics and Alfredo Petrov had. crystals. 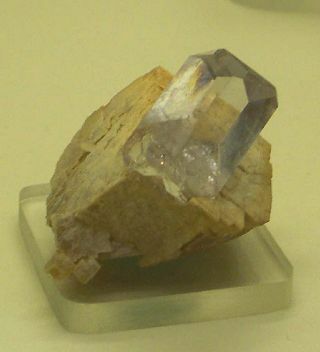 This specimen has crystals to 0.5 cm in length. 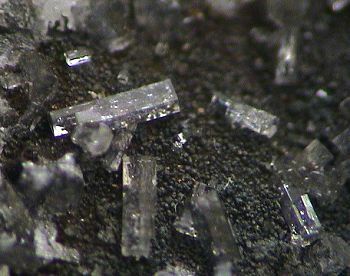 Terry also has specimens of quartz with inclusions of molybdenite crystals - some forming molybdenite phantoms from Tilama, Chile. 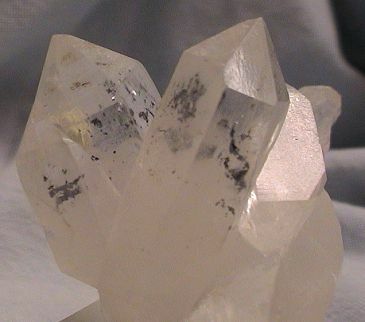 The molybdenite crystals are 1-5 mm sized perfect crystals floating in quartz. The vast majority of the specimens Terry had were buffed on one side to clearly show the inclusions. 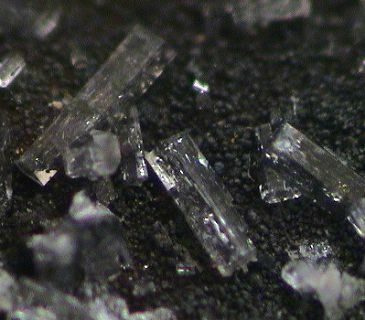 I avoided those but found several specimens with complete crystals and unbuffed surfaces. Here are two specimens of the molybdenite included quartz that Terry had that I obtained. Luiz Menezes had some fine new specimens of the variscite from the same locality that the late Carlos Barbosa had a few years ago at Tucson. 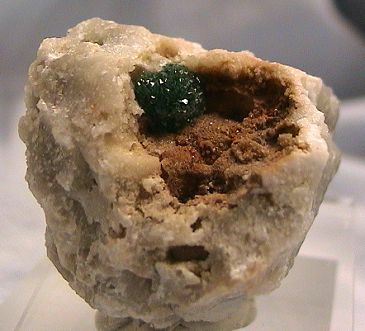 Spherical crystal clusters of deep emerald green variscite to 2/3 cm across. 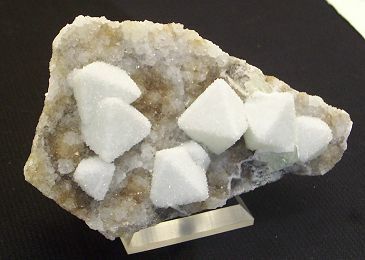 This specimen - one of several obtained from Luiz - has a 1/2 cm cluster of variscite crystals. Near the end of setup day Dudley Blauwet pulled in and started unloading his van with the help of Scott Wallace. I was afforded an opportunity to see what Dudley had that was new. I was not disappointed as there were a couple of interesting new finds from Pakistan and Afghanistan including faden adularia(!) 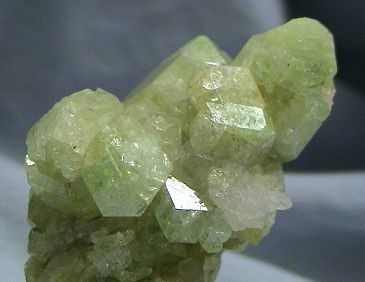 from Alchuri, Shigar Valley, Pakistan and a light green and fluorescent find of grossular from Sinzai, Darra Pech, Afghanistan. 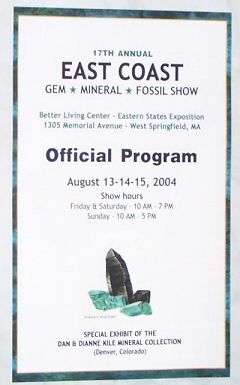 that will appear in a future issue of the Mineralogical Record. On my way out to the show I stopped in Denver to see Collector's Edge and saw one of the most unusual and attractive fluorite specimens ever. 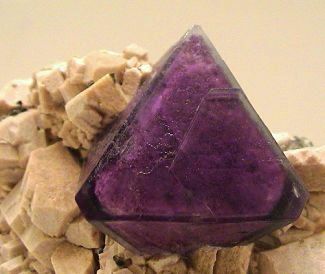 This is a perfect 3-4 cm octahedral crystal of fluorite with a phantom set on matrix of orthoclase crystals. This specimen comes from the now famous spessartine garnet location of Fujian Province in China. They had two specimens of this small and unique find and I could not resist taking one of them. Sorry, it is already sold to a collector in New York but I have not seen anything quite like it before and though it was not here at the show it almost was. 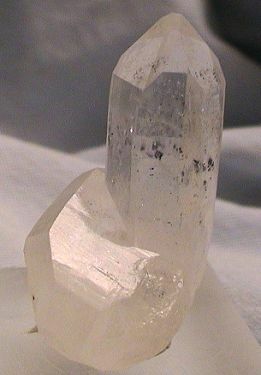 This crystal has a richly colored phantom with a colorless outer zone. The small cabinet sized matrix is comprised of pinkish orthoclase crystals. but Alan Day left the business very amicably and quite unexpectedly. You may recall that last year Isaias Casanova was not here due to a health problem. unsuspecting "victim" Nick Skirkanich of Connecticut. It is good to see IC back at the helm. Here's another venerable soul in the business - Carter Rich. Carter has ALWAYS got interesting and one-of-a-kind specimens in his display. 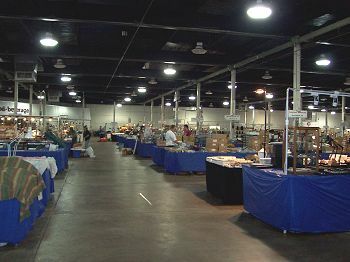 Each year show organizer Marty Zinn (Marty Zinn Expositions) arranges to have someone place some of their collection on display. 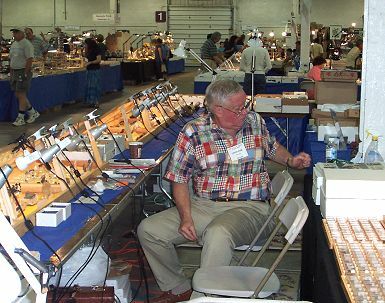 This year Marty was able to get Dan and Dianne Kile, of Denver, Colorado, to display specimens from their collection. What is of interest about their collection is that the specimens in it which are all self collected! It is all Colorado but the quality is top shelf and it is a feast for the eyes. The images below are only a sampling of the specimens that comprise this remarkable collection. 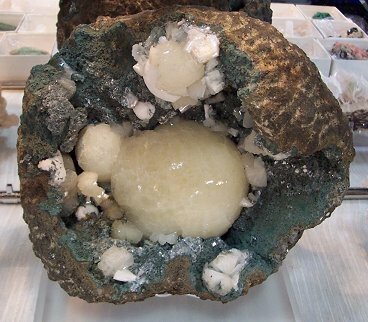 This case was filled with crystals of quartz from the Ohio Mine in Ouray County. 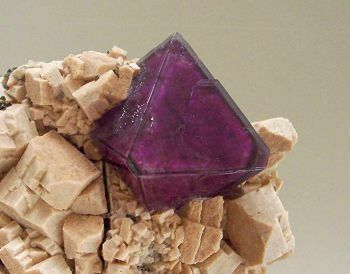 This specimen is of quartz covered fluorite from the Genoa Mine, San Juan County. 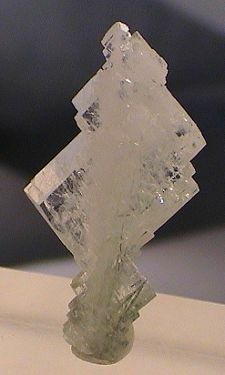 This is a specimen of gem water clear barite on calcite from Otero County. 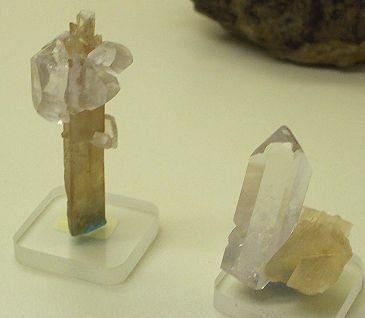 Two more specimens of barite on calcite Otero County. 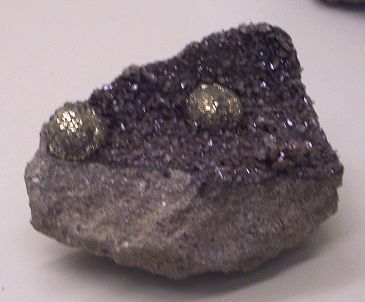 This specimen has spherical masses of crystallized pyrite on heulandite. It is from the Denver Formation in Lakewood, Colorado. specimen from State Bridge in Eagle County. 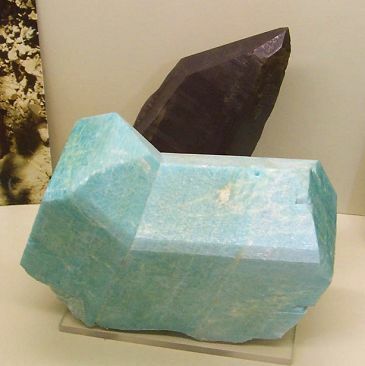 The last group of images are of superb amazonite - some with smoky quartz - specimens from the various localities in Colorado that have produced this attractive mineral. 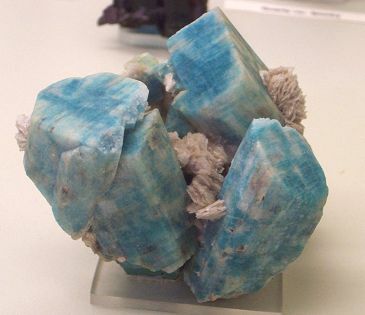 A fine cluster of deep blue colored crystals of amazonite with albite. 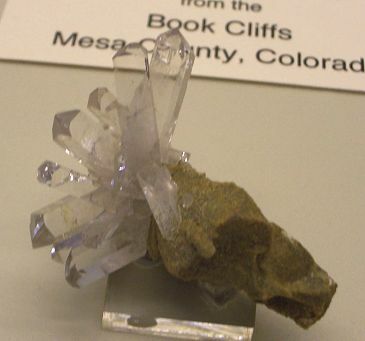 This specimen comes from Crystal Peak, Teller County. 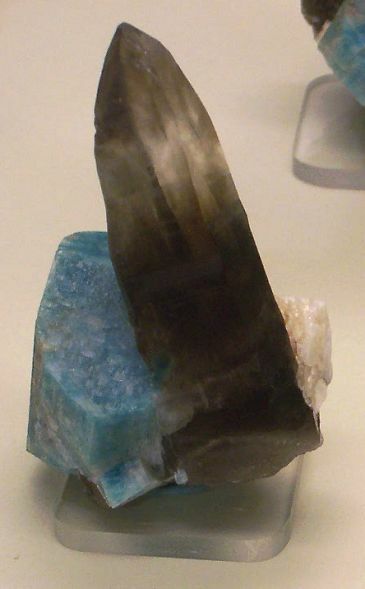 This is a twin crystal of amazonite with smoky quartz from Crystal Peak, Teller County. 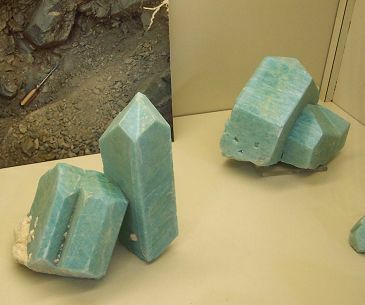 Baveno twin crystals of amazonite from Crystal Peak, Teller County. 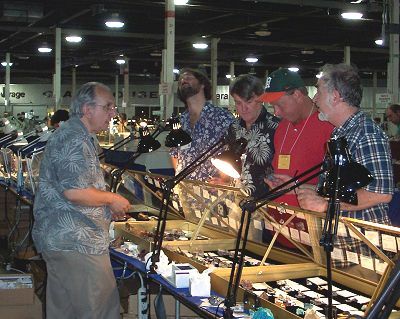 There were many more US dealers, like myself, here to buy specimens than last year. I suspect that the hard exchange rate of the US Dollar vs the Euro has something to do with it since there were fewer US dealers at Sainte Marie for that reason. I found many good pieces that will appear in Auctions and future updates. 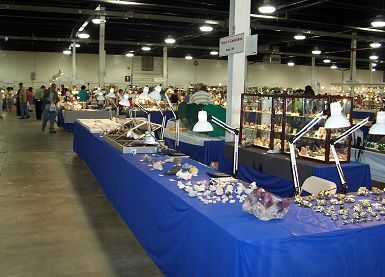 I will be posting the new find specimens shortly after my return to Weaverville this coming week along with a random selection of interesting specimens found at the show.